Barnoski Painting is a full service professional painting company. We offer a variety of painting services to achieve the look and result you desire. Whether repainting your interior or exterior, we provide a premium service for all your painting needs. Each job starts with trust and confidence and that is why all jobs/estimates are inspected by a professional experienced craftsman — not a salesman. Painting your home is a necessary investment to keep your home in excellent condition, which reflects in its value and re-sale value. Every job is detailed for each individual home, but our overall process is a result of proven technique and experience since 1976 which is superior to any other method. We are detailed and flexible enough to work within a budget, however we don’t do cheap work and we never overcharge, we simply do the best jobs at the best price. Painting nice homes for nice people is our main focus, it’s what we enjoy, we like improving neighborhoods and our community and its always nice to give a house a fresh new look. Every job is a hands on paint job done by the owners of the company and once we start a job we stay until it is completed. We are skilled craftsmen and full time professional painters. Our crew has been together for decades. 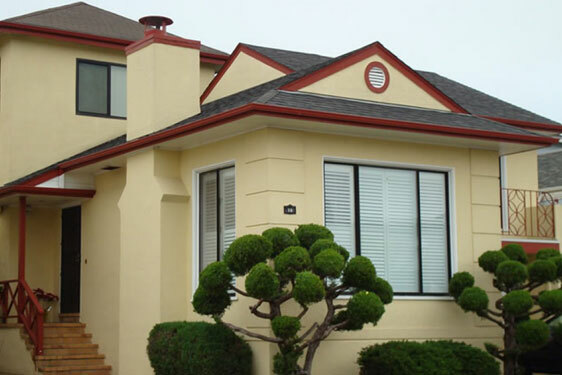 We have been painting in San Francisco, Daly City and the peninsula for over 40 years and have created the best procedures to work around the weather and moist conditions. All of our work and products are above industry standard and state requirements, but we can work within your budget to produce the best value for your money. All work is guaranteed for 5 years. All jobs should last an average of 10 years, normally 8 to 12 years depending on conditions. Call or email today for a no-obligation, free estimate.